Sharp renovation near Farmer's Market and Capitol. 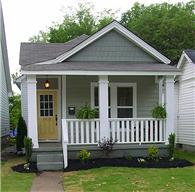 Historic high ceilings, chunky trim, new granite kitchen, windows, flooring, baths, deck, roof, HVAC. Move-in ready with blinds, fresh paint. Exposed brick fireplace (decorative only.) Beautiful!